Rinaldo Marmara, president of Caritas Turkey. Credit: Daniel Ibanez/CNA. Istanbul, Turkey, Nov 30, 2014 / 03:08 pm (CNA).- The head of a charitable agency in Turkey voiced hope that Pope Francis’ visit will shine a light on the dramatic plight of refugees there, who fled the Syrian civil war and other regional conflicts. “There are 1.7 million Syrian refugees in Turkey; in Istanbul alone, there are 700,000. When you walk around downtown Istanbul, there are plenty of poor kids who beg,” said Rinaldo Marmara, president of Caritas Turkey. “Our dream is to be able to let the refugees live here and at the same time to work in order to let them go back to their home countries,” Marmara told CNA. Marmara met with the Pope during the three-day papal trip to Turkey at the end of November. On that trip, the Pope visited with refugees, telling them that God never forgets them. Pope Francis also celebrated Mass at the Holy Spirit Cathedral in Istanbul. 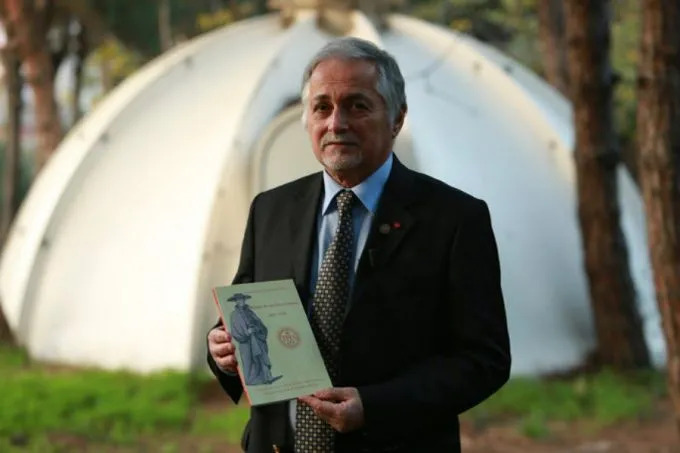 Upon meeting him, Marmara presented the Holy Father with a book he had written about the history of the first Jesuits who went to evangelize Turkey. “The history of Jesuits is intimately linked to the history of the Church in Turkey. Jesuits have been the first to come to this Eastern land, this is a long story, a very beautiful story which I tried to show,” Marmara said.